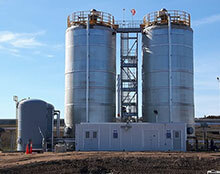 Biogasclean supplies a full range of biological H2S removal systems; from small gas cleaners to the world's largest biological gas cleaners at ethanol distilleries and paper mills. 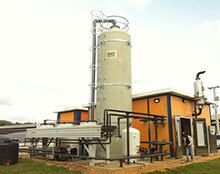 The gas cleaners can be designed to handle any flow and H2S content in the raw biogas. Typically the H2S is reduced to 100-250 ppm but Biogasclean can reduce to lower values if required. The process is 100% biological and operating costs 80-90% lower than chemical gas cleaning systems. The availability is above 98%. The only residue from the process is a valuable liquid fertilizer. Easy to ship worldwide; the gas cleaner can be shipped on a truck or in one 40 feet container. The PTU – the Process Technique Unit - is the machine room and contains PLC controller board, circulation pump, air blower, valves, flow meters and – if required – also gas detector system and heating system installed in a small custom built fiberglass container. The scrubber tank is manufactured in high quality fiberglass and supplied with a grating so it is possible to inspect the tank underneath the packing media. The tank is supplied with ladder and handrail. ​Most affordable; the costs are kept down as the tank is without grating and not designed for being filled with water and the control center is skid mounted. The PTU – the Process Technique Unit - is the control center with PLC controller board, circulation pump, air blower, valves, flow meters and - if required – also heating system installed on a skid. The scrubber tank is manufactured in high quality fiberglass. The tank is supplied with ladder and handrail. 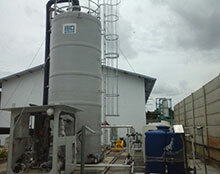 ​The packing media is manufactured in plastic and shall be moved outside the tank for cleaning. The popular choice. This type is for smaller and larger H2S loads. We manufacture fiberglass tanks in several countries to reduce transportation costs. The PTU – the Process Technique Unit - is the machine room and contains PLC controller board, circulation pump, air blower, valves, flow meters, gas detector system and – if required – also heating system installed in a custom built fiberglass container or a modified shipping container. The scrubber tank is manufactured in high quality fiberglass and supplied with a grating so it is possible to inspect the tank underneath the packing media. The tank is supplied with ladder and handrail and - if required – also with insulation. The tank is so strong that it can be filled with water. We manufacture fiberglass tanks in several countries to reduce transportation costs. For high H2S loads. This type is for large H2S loads at a.o. ethanol distilleries and paper mills. The diameter of the tank is so big that it is not possible to transport from a workshop; therefore the tank is manufactured on site. The scrubber tank is manufactured in high quality fiberglass or mild steel with acid-proof liner andsupplied with a grating so it is possible to inspect the tank underneath the packing media. The tank is supplied with ladder and handrail and - if required – also with insulation. The tank is so strong that it can be filled with water. The diameter of the tank is so big that it is not possible to transport from a workshop; therefore the tank is manufactured on site. The packing media is manufactured in plastic and can be cleaned inside the tank with the QSR® - Quick Sludge Removal - system. This will reduce downtime and increase revenues.